Menachem Mendel Schneerson, the Lubavitch rabbi, reached the Biblical age of 70 yesterday, but he has been living in the age of the Bible every one of those years. "Age makes my life more exacting," he said. "My age is demanding more of me." For him revealed law is not only a commanding presence but also literal truth. For thousands of followers round the world, it is the Lubavitch rabbi himself who is guide to the commands and interpreter of the truth. Thus it has been, if not since the world began, 5732 years ago by the Jewish calendar's reckoning then at least since the 18th century, when the Lubavitch movement was founded. The rabbi decided to use his birthday as a pretext for demanding of his followers what he called "an additional portion of study and devotion to the cause of s goodness and kindness." "I think that is a very good challenge, not only for me — it is a very good challenge for them," he said. There would be a farbrengen (get-together) for his birthday, with about 1,500 of the male faithful jammed into the synagogue (women upstairs, looking on from behind smoked glass) at 770 Eastern Parkway in Brooklyn, to hear the Lubavitcher deliver one of his extraordinary marathon addresses. As customary the rabbi would begin with a half-hour warm-up talk. As he speaks, many in the throng rock back and forth, or side to side. Clad in black, they suggest vast collection of somber grandfather clocks, each keeping time in its distinctive pendular way. Sometimes whole lines of the crowded faithful sway together, like waves sweeping to the rabbi's shore. Here and there a clock stands rapt and still. When the rabbi finally pauses they swing into a joyous Hasidic hymn, often wordless. Here song is heard as the expression of the soul, and without words the soul is unconfined. Slowly, the rabbi picks up the rhythm with his shoulders and head, and suddenly he is bouncing vigorously up and down in his chair to the music's beat. His feet swing left and right under the white tablecloth that covers the table in front of him. The harder he bounces the louder his audience sings. Slowly he eases himself back to a stationary position and the singing calms from thunderous unison to silence. He resumes his discourse — each half-hour portion a separate homily or argument. Except on the Sabbath, his words (Yiddish interspersed with Hebrew) are carried by loudspeakers to those who have been unable to get into the synagogue, and by open telephone lines to a dozen Lubavitch centers round the world. On the Sabbath, when the Orthodox will not use recording instruments, two or three followers who have extraordinary memories listen carefully and then put together a verbatim record. The Lubavitch rabbi never uses notes and never hesitates, even during his six-hour talks. Words and music are variations on themes that owe much to the teachings of the founder of Hasidism, the Baal Shem Tov — Master of the Good Name — an 18th-century mystic who taught pious joy in the performance of commandments. The Baal Sham Toy spread the word that a simple man who prayed sincerely was better than a Talmudic scholar whose heart was cold. 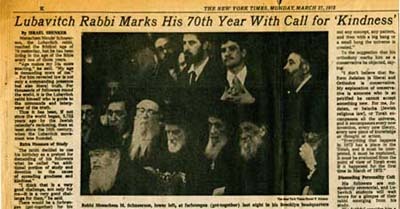 One group of believers subsequently attached itself to Rabbi Schneur Zalman (1745-1813), whose movement became known as Chabad Hasidism — "Chabad" being an acronym for the Hebrew words for wisdom, understanding and knowledge. Rabbi Schneur Zalman urged his faithful to serve G‑d (Orthodox Jews refrain from spelling out fully names for the deity) with mind that understands, heart that feels and hand that performs. He became known as the Alter Rebbe (old rabbi), his son was the Mittler Rebbe (middle rabbi), and his grand son (third in the dynasty) took the name Schneersohn. It was the Mittler Rebbe who settled in Lubavitch, a village in Belorussia that was to be the center of Chabad for 102 years. In 1940 the sixth Lubavitch rabbi, a great-great-great grandson of the first, moved to America and settled in Brooklyn. When he died in 1950, his second son-in-law, the current Lubavitch rabbi, succeeded him. Rabbi Menachem Mendel Schneerson (the "h" in Schneersohn has been dropped, for no profound reason) also happens to be a great-great-great-great grandson of the founder. There was no election, but he was the natural candidate on dynastic grounds and on the basis of his scholarship and personal qualities. The Russian-born rabbi lives only three blocks away from Lubavitch headquarters. Twice a month he takes his only trips outside Brooklyn — to Queens, to stand silently at the grave of his father-in-law. Since the Lubavitcher never visits anyone else, his faithful come to him. Even the President of Israel, Zalman Shazar, whose name was taken from that of the first Lubavitcher, regularly pays two visits in the United States — first to the President in Washington, and then to the rabbi who lives on President Street In Brooklyn. Lubavitch faithful like to joke that President Shazar comes to see President Nixon so that he will have an excuse to visit the Lubavitcher. The rabbi receives visitors twice a week — Thursdays and Sundays beginning at 8 P.M. and often continuing till dawn or later. He explains that after 8 P.M. it is difficult to reach people at their work, so time is available for visitors. Lubavitch believers come from many countries, often flying halfway round the world simply to ask their rabbi a question or to receive his blessing. His followers — many write instead of coming in person, and he personally opens all the mail — ask him about theology business, family affairs, even medical problems. How can he possibly reply to such a range or concerns? "I am not afraid to answer that I don't know," he replied. "If I know, then I have no right not to answer. When someone comes to you for help and you can help him to the best of your knowledge, and you refuse him this help, you become a cause of his suffering." At a recent audience, just before the rays of dawn eased over Eastern Parkway, the Lubavitcher gazed intently at his visitor, and from time to time a warm remarkably gentle smile lit his face. Stroking his gray beard, he explained his role as "awakening in everyone the potential that he has." On fundamentals, the rabbi has no doubts. "If you can accept that G‑d Almighty created billions and billions of atoms, why can't you accept that G‑d Almighty created a human being?" "If you are enthusiastic to substitute for the term 'G‑d' the word 'mystery,' then I'll ask you the same thing about 'mystery.' It is much easier to accept one human being, two human beings, than to accept billions of disordered atoms whirling around without any concept, any pattern, and then with a big bang or a small bang the universe is created." "I don't believe that Reform Judaism is liberal and Orthodox is conservative. My explanation of conservative is someone who is so petrified he cannot accept something new. For me, Judaism, or halacha [Jewish religious law], or Torah encompasses all the universe, and it encompasses every new invention, every new theory, every new piece of knowledge or thought or action. "Everything that happens in 1972 has a place in the Torah, and it must be interpreted, it must be explained, it must be evaluated from the point of view of Torah even if it happened for the first time in March of 1972." His followers are outspokenly reverential, and Lubavitch students will wait hours for a glimpse of their rabbi emerging from his study. The faithful consider him a tzaddik (holy man), but that is not the way the rabbi sees himself — "Because I am not a tzaddik," he explained. He continued: "I have never given any reason for a cult of personality, and I do all in my power to dissuade them from making it that." The Lubavitcher rabbi and his wife, married since 1929, are childless. Who is to be the eighth Lubavitcher rabbi? "The Messiah will come and he will take all these troubles and doubts," replied the seventh, and added smilingly: "He could come while I am here. Why postpone His coming?" "My intention is to live many years more, and the Messiah can come tomorrow or the day after tomorrow," he said. "There's a very great deal to achieve, enough not only for my life but even for more than 120 years." He added: "The Messiah will be a real human being. Don't translate him as something abstract. He is tangible. He has two eyes, two ears, two legs, two hands and one heart. The heart has four compartments. One compartment is for impure blood, which the heart makes into pure blood. And that is the function of the Messiah."